In one of the more exciting developments this past year, we got to watch the continued transformation of Freedom Mobile. Between the addition of the iPhone to its device lineup, numerous excellent promotional offers throughout the year and, perhaps most importantly, a LTE network that’s slowly but surely getting better in terms of coverage, reliability and device compatibility, Freedom Mobile had a banner year. For the first time in a long time, it seems like the carrier might actually live up to its billing of legitimate fourth player. To help us look back at the year Freedom had, as well as look forward to its future, we have not one but two special guests joining the SyrupCast: the Globe and Mail’s Christine Dobby and Android Central‘s Daniel Bader. That said, as with past episodes on topics like this, we want your input. Is Freedom Mobile capable of stirring actual competition between the Big Three? More importantly, does current owner Shaw even have any interest in disrupting the Canadian ecosystem? 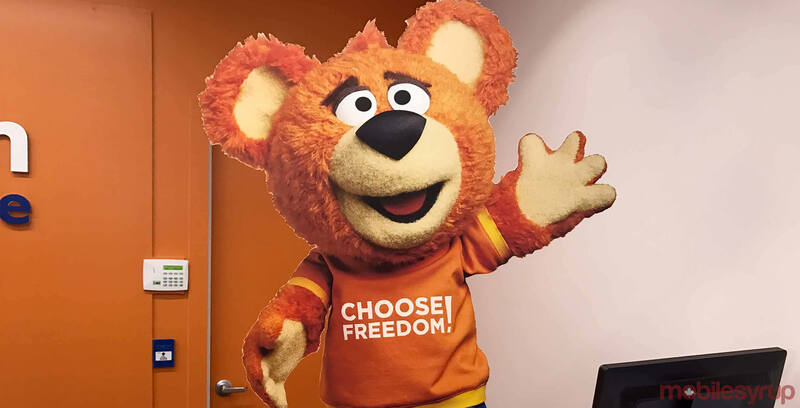 If Freedom Mobile were to become Canada’s T-Mobile, how soon do you see that transformation taking place? What will happen to Freedom Bear? a) Leave your question or comment in the comment section below. Please try to keep it concise and to-the-point. b) Email your question or comment to podcast(at)mobilesyrup(dot)com. c) If writing isn’t your thing but you would still like to have your voice heard, you can send your answer via voice recording (again to podcast(at)mobilesyrup(dot)com. Our podcast producer extraordinaire will then add it the recording. We’ll share the best answers on the SyrupCast.